Expand your quilting skills or learn new creative outlets with quilting classes and workshops in Guymon, Oklahoma. 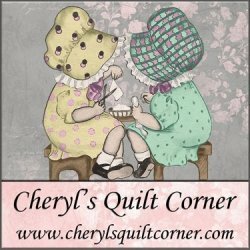 Cheryl’s Quilt Corner is one of Oklahoma’s great home-town fabric stores, keeping traditions alive with expert technique and inspiring instruction. Beginners, experts and students everywhere in between are welcome to Cheryl’s diverse class selection. Learn a wide array of simple and intricate patterns and techniques to create beautiful new quilts. Create your own stained glass quilts, traditional star, heart and lover’s knot designs and many other traditional patterns used throughout U.S. history. Utilize top-quality batting, cloth and threads of any color you choose to create the ideal quilt for you or your loved ones. Quilting is a relaxing outlet and a colorful expression of character and creativity producing a craft you and your family can enjoy for years to come. Start your very first quilt or learn new techniques and designs with an expert. Cheryl guides quilters of every age and level of expertise to a finished craft expressing their own personality. Contact Cheryl today to join a class or arrange workshop for your group outing in Guymon, Oklahoma. Please note that hand guided quilting is not computerized, it is hand guided, resulting in some variance in repetitive patterns. Our Statler Stitched quilting is computerized, which allows us to provide the highest quality precision stitching and quilting available. * You do not need to baste or pin your quilt. * If you are mailing the batting, please prepare the batting as necessary per mfg. instructions. All of the binding is completely machine stitched. We make a double binding, and then we sew the binding to the front of the quilt. We will fold the binding over to the back and finish the stitching from the back. We can also sew the binding on the front of the quilt for you to hand-finish. We will use white or natural thread on your quilt, or choose from our large selection of colors to match the color of your quilt. If we have to special order your thread, we will contact you and there will be an additional charge. We charge $ 1.00 per double bobbin. Prices are based by the square inch of the quilt (length X width X price per square inch). If you find yourself in a rush to have your quilt back much sooner we’ll do our best to rush it through and get it out as soon as possible; however, there will be a rush order charge of $25.00 added. For more information about the quilting services at Cheryl’s Quilt Corner, please contact us today. Make sure you check out our online store for all of your quilting fabrics, products and accessories! Have you ever wanted to learn to quilt? Cheryl conducts classes for all quilting levels, beginning to advanced. Listed below are some of the available classes along with pictures of some of the most recent students. Class samples are available for your group to borrow in advance of your workshop, please let me know when you initially schedule so a sample can be reserved. Again, this reservation must be made at the time of the class scheduling to ensure that you will have a sample available. The charges will depend on the particular class and length of time. Is your quilting group looking for a new and exciting program? Look no further. Your group will be in awe as Cheryl presents her exciting Stained Glass lecture and trunk show. During Cheryl’s trunk show you will see a minimum of fifty Stained Glass quilt samples, each guaranteed to leave you breathless. Cheryl will share her quick, easy techniques she has perfected as she encourages and inspires you to try some Stained Glass quilting of your own. Cheryl will show you that you don’t have to be a master quilter to create beautiful eye-catching heirlooms to be passed down from generation to generation. Basic skills developed from everyday quilting are easily transferred to making stained class quilts. Come discover the joys of working like the old masters, not in lead and glass but in fabric and thread. For additional information, fees, or to book Cheryl’s Stained Glass Lecture/Trunk Show/Workshop, email Cheryl. Cheryl has developed a new, quick, fun, and easy technique for doing what appears to be a difficult concept. 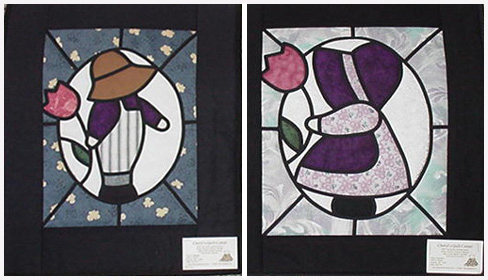 After creating your own Sue or Sam you’ll be a Stained Glass Quilting PRO! Check out some of my happy students in The Gallery! Detailed class descriptions and additional information available upon request.